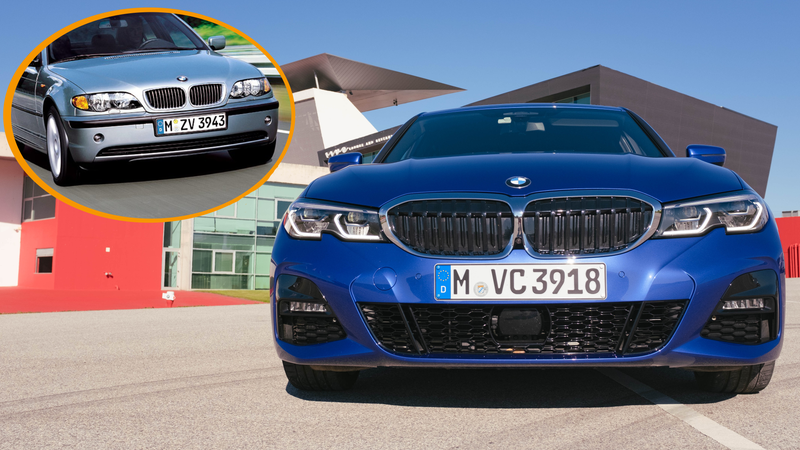 The world fell to silence on October 2 when BMW revealed the first awkward press photos of the seventh-generation 2019 BMW 3 Series. Why did the back end look like a Lexus? Why does the front have a weird notch in the headlights? Has BMW lost its mind? Well, no, it’s just the Germans trying to be cute. At the global first drive event for the new 3 Series in Portugal last week, BMW offered a brief design presentation to explain the inspiration for the new body style of the G20 3 Series—a design which really grows on you after a couple of days seeing it in person, by the way. In that presentation, the audience of bored faces all awoke at the mention of the new car’s headlight notch being inspired by everybody’s first or second favorite 3 Series, the E46. Look at that. Those sure are similar, now that it’s been specifically brought to my attention, but I definitely missed the point at first (ha ha). Did this little bit of designer inspiration change my opinion of the new car’s design? Not really, but I will say that having driven it around for a few days photographing it for tomorrow’s first impressions post, I have warmed up to the new look of the 330i quite a bit. Even the rear-end. Now knowing what you know, how do you feel about the notch? Would you feel better about it if it also had a headlight washer function like the old one? Is this a good nod to the past? Does the notch mean the G20 also drives like the old E46? Find out tomorrow! That’s because our first drive review drops tomorrow! So you gotta wait, like, a day! Just a day!